QSL Cards used in the United States are generally 5.5 Inches by 3.5 Inches. will only accept a card at this size. created. More of that later. We will use QSL Card - QSL6 as seen on this site. 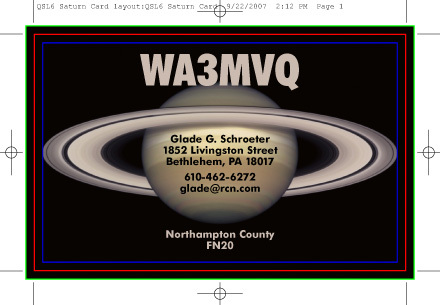 If you look at the image of QSL6, will notice a red outline. This is the card edge. area will be trimmed off the card and discarded. The blue outline is the margin. is a possibility that some of the margin area will also be removed. compression (highest quality) setting your camera can produce. If your image is in RGB, let it in that color space. If it is in CMYK, then let it there. there are many technical considerations to address. QuarkXpress or InDesign. These two programs will produce the best results. specific settings for sending a Photoshop file to me. correct many of the easily made mistakes.